Bha Ruaraidh MacThòmais (Beurla: Derick S. Thomson), MA, BA, DLitt, FRSE, FBA (5 an Lùnasdal 1921 – 21 am Màrt 2012) na sgoilear, dheasaiche agus bhàrd. Bha e an sàs ann an iomadh iomairt co-cheangailte ri ath-bheòthachadh na Gàidhlig. Bha e a' toirt taic do neo-eisimeileachd na h-Alba fad a bheatha. Rugadh Ruaraidh MacThòmais 5 an Lùnasdal 1921 ann an Steòrnabhagh ann an Leòdhas. Bha athair Ruaraidh, Seumas MacThòmais (1888-1971), na bhàrd ainmeil cuideachd. B' ann à Tunga, Leòdhas, a bha athair, agus b' ann à Ceòs, air na Lochan, a bha a mhàthair, Tìneag Aonghais Alasdair (Christina "Tina" Mac a' Ghobhainn). Fhuair Seumas obair mar mhaighstir-sgoile ann am Pabail a' Rubha nuair a bha Ruaraidh aon bhliadhna a dh'aois, agus dh'imrich an teaghlach a Phabail Uarach. Thogadh Ruaraidh ann am Pabail, anns an dearbh àite far an do thogadh dà sgrìobhadair Gàidhlig ainmeil eile: Iain Mac a' Ghobhainn agus Anne Frater. Thòisich Ruaraidh a chuid foghlam fhaighinn ann an Sgoil MhicNeacail ann an Steòrnabhagh, an uair sin chaidh e do dh'Oilthigh Obar Dheathain, far an do rinn e ceum ann an Ceiltis. Chuir e ùine seachad ann am Feachd Rìoghail an Adhair eadar 1941 agus 1945. As dèidh a' chogaidh, chuir e crìoch air an ceum agus chaidh e do dh'Oilthigh Chambridge agus do dh'Oilthigh Bhangor. Ann an 1952, phòs e Carol Nic a' Bhreatannaich, agus bha sianar chloinne aca. Bha e a' teagasg aig Oilthigh Dhùn Èideann, aig Oilthigh Obar Dheathain agus aig Oilthigh Ghlaschu, far an robh e na àrd-ollamh ann an Ceiltis bho 1963 a-mach gus an do leig e a dreuchd air ann an 1991. Bha e air a' chuid as motha de bheatha a chuir seachad ann an Glaschu. Chaochail Ruaraidh MacThòmais ann an 2012 an Glaschu, nuair a bha e 90 bliadhna a dh'aois. Tha e cliùiteach ais sgàth 's gun do chuir e Gairm air bhonn còmhla ri Fionnlagh J MacDhòmhnaill. Bha an iris a' ruith fad 50 bliadhna agus bha i gu tùr ann an Gàidhlig agus mar sin a' brosnachadh sgrìobhadairean Gàidhlig. Ann an 1968, stèidhich e Comhairle nan Leabhraichean. Chaidh am pròiseact seo a stèidheachadh aig Roinn na Ceiltis, Oilthigh Ghlaschu ann an 1966, nuair a bha Ruaraidh MacThòmais na àrd-ollamh. Bha e air an fho-chomataidh dhen Scottish Certificate of Education Examination Board a chur ri chèile a' chiad aithisg air Gnàthachas litreachaidh na Gàidhlig (GOC) ann an 1981. Bha MacThòmais na chathraiche de Chomhairle nan Leabhraichean eadar 1968 is 1991 agus na cheann-suidhe den Scottish Gaelic Texts Society cuideachd. An Dealbh Briste / The Broken Picture (1951). Eadar Samhradh is Foghar / Between Summer and Autumn (1967). Sùil air Fàire / Surveying the Horizon (2007). Steòrnabhagh: Acair. 'Bean a' Mhinisteir', Gairm 22 (1957): cuideachd ann an (1985) Eadar Peann is Pàipear Dòmhnall Iain MacÌomhair (deas.) Glaschu: Gairm, d.139-144. 'Mar Chuimhneachan', Gairm 31 (1960): cuideachd ann an (1985) Eadar Peann is Pàipear Dòmhnall Iain MacÌomhair (deas.) Glaschu: Gairm, d.70-74. 'Tea Feasgair', Gairm 35 (1961): cuideachd ann an (1985) Eadar Peann is Pàipear Dòmhnall Iain MacÌomhair (deas.) Glaschu: Gairm, d.104-107. ↑ “Obituary: Professor Derick Thomson; writer and scholar who was the most important voice in Gaelic poetry in the 20th century - News”, An t-Albannach. 3s dhen Ghiblean 2012. Air a thogail 7mh dhen Iuchar 2012. ↑ Meek, Dòmhnall (5mh dhen Ghiblean 2013): “Appreciation of Professor Derick S. Thomson: funeral oration, as delivered.”. Passages from Tiree. Air a thogail 5mh dhen Lùnasdal 2017. ↑ “20mh linn – Eachdraidh na Roinne”. Sgeul na Gàidhlig aig Oilthigh Ghlaschu. Air a thogail 5mh dhen Lùnasdal 2017. 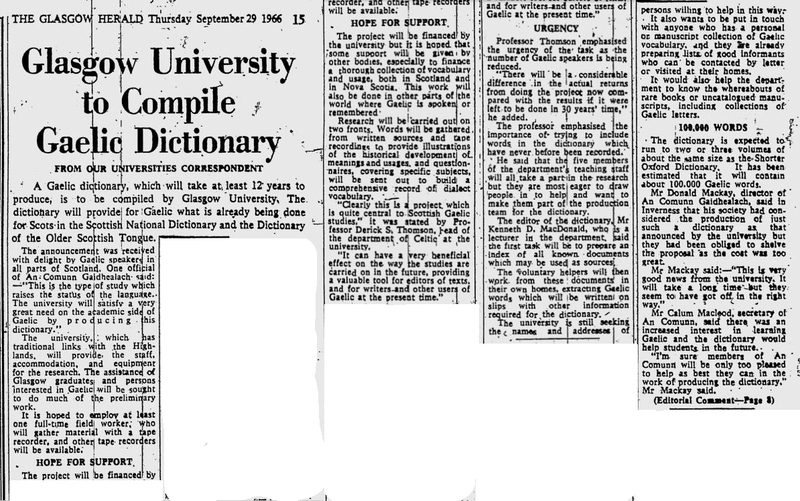 ↑ "Glasgow University to Compile Gaelic Dictionary". The Glasgow Herald, Diardaoin 29 an t-Sultain, 1996. ↑ Gaelic orthographic conventions: Certificate of Sixth Year Studies in 1985 and after 1988. Dalkeith: Scottish Examination Board, 1981. Air a tharraing à "https://gd.wikipedia.org/w/index.php?title=Ruaraidh_MacThòmais&oldid=545938"
Chaidh an duilleag seo a dheasachadh 12 dhen Mhàrt 2019 aig 18:59 turas mu dheireadh.